To Cite: Hemmeti A A, Zerafatfard M R, Goudarzi M, Khodayar M J, Rezaie A, et al. Ameliorative Effects of Atorvastatin on Bleomycin-Induced Pulmonary Fibrosis in Rats, Jundishapur J Nat Pharm Prod. 2016 ; 11(4):e13370. doi: 10.17795/jjnpp-13370. Background: Pulmonary ﬁbrosis is an idiopathic and chronic inﬂammatory interstitial lung disease, with a negligible response to available medical therapies and potentially fatal prognosis. Statins (3-hydroxy-3-methylglutaryl-coenzyme A [HMG CoA] reductase inhibitors) have broad pleiotropic properties and are used to treat multiple diseases. Objectives: The purpose of this study was to investigate the effect of different doses of atorvastatin (10, 20, and 40 mg/kg) on bleomycin (BLM)-induced pulmonary fibrosis in rats. Methods: Thirty female 8-wk-old Sprague Dawley rats, weighing 200 ± 20 g, were randomly divided into five experimental groups. Group 1 (control) received saline intratracheally (IT), group 2 received a single dose of BLM (7.5 UI/kg/mL, IT) on day 7 and no treatment, and groups 3 - 5 received atorvastatin orally at doses of 10, 20, and 40 mg/kg, respectively, one week before and again three weeks after BLM administration. The rats were sacriﬁced 21 days after the administration of BLM. Blood and lungs were collected for plasma malondialdehyde (MDA), lung hydroxyproline, and histopathological examination. Results: The results showed that lung hydroxyproline and plasma MDA levels were significantly reduced in the atorvastatin-treated groups, especially the 40 mg/kg group, compared to the BLM untreated group (P < 0.05). Furthermore, atorvastatin prevented infiltration of inflammatory cells, proliferation of fibroblasts, and alveolar thickening due to BLM. Conclusions: Atorvastatin may play a protective role in pulmonary fibrosis, with its effects mediated via the station’s antioxidant and anti-inflammatory properties. Atorvastatin may be a potential agent for the treatment of lung injury and fibrosis. Pulmonary ﬁbrosis is an idiopathic and chronic inﬂammatory interstitial lung disease, with a negligible response to available medical therapies and potentially fatal prognosis (1). Although the pathophysiology of pulmonary ﬁbrosis remains unclear, the release of harmful amounts of reactive oxygen species (ROS) by activated inﬂammatory cells, which accumulate in the lower airways, is thought to result in lung injury due to an increase in ﬁbroblasts in the alveolar walls. The activated ﬁbroblasts lead to an increase in the content of extracellular matrix proteins and the destruction of normal lung structure, thereby damaging the vital gas exchange role of the lungs (2, 3). Bleomycin (BLM) is commonly used in the cytostatic treatment of several types of tumors, such as germ-cell tumors, lymphomas, and Kaposi’s squamous cell carcinomas of the head and neck. However, BLM may be associated with fatal side effects, of which pulmonary toxicity is the most serious. BLM-induced lung toxicity involves inflammation and fibrosis. Experimental BLM-induced lung fibrosis is a well-studied and accepted model of fibrogenesis (4-7). As this model of pulmonary fibrosis resembles that seen in humans, it has been used to assess the effects of potential therapeutic agents. By blocking the conversion of 3-hydroxy-3-methyl glutaryl coenzyme A (HMG CoA) to mevalonate, HMG CoA reductase inhibitors (statins) act as potent inhibitors of cholesterol and isoprenoid biosynthesis (8, 9). Recent experimental and clinical evidence indicate that the effects of statins may extend beyond their ability to reduce serum cholesterol levels (10). Cholesterol-independent and pleiotropic effects of statins include improved endothelial function and reduction of oxidative stress and vascular inflammation (11-13). Several recent studies showed that the aforementioned positive effects of statins were due both to their lipid-lowering and anti-inflammatory effects. Research also demonstrated that the anti-inflammatory effects of statins could be seen as early as two weeks after starting statin treatment. Statins decreased the release of proinﬂammatory mediators, such as C-reactive protein, by hepatocytes (14). Atorvastatin, a widely used statin, reduced the activation of NF-kB and expression of chemokines induced by angiotensin II in vascular smooth muscle cells (15), as well as decreasing free radical production (16). Studies also demonstrated that metabolites of atorvastatin possessed potent antioxidative properties (17, 18) and protected very low-density lipoproteins (VLDLs), low-density lipoproteins (LDLs), and high-density lipoproteins (HDLs) from oxidation (19). Besides being a potent HMG-CoA reductase inhibitor, atorvastatin has the longest half-life among the available statins, which contributes to its high efficacy. The beneﬁcial effects of atorvastatin on BLM-induced pulmonary fibrosis were previously conﬁrmed (20). In view of its long half-life and conflicting reports about its antioxidant characteristics, atorvastatin was chosen from the available statins for this study. 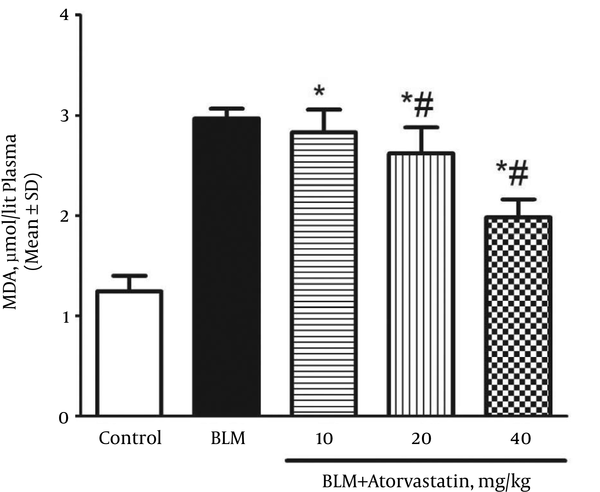 The aim of this study was to confirm the beneﬁcial effects of atorvastatin on BLM-induced lung injury and fibrosis and explore the dose dependency of atorvastatin. Atorvastatin calcium was obtained from Exir pharmaceutical manufacturing company (Borujerd, Iran). BLM was purchased from Nippon Kayaku (Tokyo, Japan). Trichloroacetic acid, thiobarbituric acid (TBA), chloramine T, dimethyl benzaldehyde, and L-hydroxyproline were purchased from the Sigma-Aldrich Chemical Company (St. Louis, MO, U.S.). All chemicals and reagents used were of analytical grade. Thirty female 8-wk-old Sprague Dawley rats, weighing 200 ± 20 g, were obtained from Ahvaz Jundishapur University of Medical Sciences animal house. The rats were kept in polypropylene cages and given standard rat chow, with access to drinking water ad libitum. The animals were maintained under controlled conditions at a temperature of 20 ± 2°C and a 12-h light: 12-h dark cycle. The study was performed according to the animal ethics committee guidelines for the use of experimental animals. The rats were randomly divided into five experimental groups (six animals in each group) and treated according to the following protocol. Group 1 (control), received normal saline intratracheally (IT, 1 mL/kg), group 2 received a single dose of BLM (7.5 UI/kg/mL in normal saline, IT) on day 7 and no treatment, and groups 3 - 5 received atorvastatin orally at doses of 10, 20, and 40 mg/kg, respectively, one week before and three weeks after BLM administration (21, 22). At the end of the experimental period (28th day), the animals were anesthetized with ketamine/xylazine, and blood samples were collected. The plasma was separated by centrifugation for 10 minutes at 3000 rpm and stored at -80°C until the analysis. The lungs were quickly isolated, weighed, and washed with saline. Sections of the lung were dissected and ﬁxed immediately in 10% phosphate-buffered formaldehyde. The sections (3 µm) were stained with hematoxylin and eosin (H&E) for histological examination. The Ashcroft score was used for a semi-quantitative assessment of fibrotic changes. The mean score in 25 microscopic fields in each rat histological lung section was used to classify the severity of fibrotic changes. The mean of the scores from all the fields in each section was considered the fibrotic score. The entire lung section was reviewed at a magniﬁcation of × 100. A score ranging from 0 (normal lung) to 8 (total ﬁbrosis) was assigned. The mean score of all the ﬁelds was taken as the ﬁbrosis score of that lung section. The criteria for grading pulmonary ﬁbrosis were as follows: 0 denoted a normal lung; 1 denoted minimal ﬁbrosis thickening of the alveolar or bronchial walls; 2 - 3 denoted moderate thickening of the walls, without obvious damage to the lung architecture; 4 - 5 denoted increased ﬁbrosis, with deﬁnite damage to the lung architecture and formation of ﬁbrotic bands or small ﬁbrotic masses; 6 - 7 denoted severe distortion of the structure and large ﬁbrotic areas (“honeycomb lung” was placed in this category); and 8 denoted ﬁbrotic changes in all the ﬁelds. The mean score of all the ﬁelds was taken as the ﬁbrosis score of that lung section (23). The total collagen content of the left lung was measured using a colorimetric assay to determine the lung hydroxyproline content (24, 25). In brief, the left lung lobes were minced and homogenized in 6 M HCl and hydrolyzed for 5 h at 130°C. The pH was adjusted to 6.5 - 7.0 with NaOH, and the sample volume was adjusted to 30 mL with distilled water. The sample solution (1.0 mL) was mixed with 1.0 mL of chloramine T solution (0.05 mol/L), and the mixture was then incubated at room temperature for 20 minutes. After the addition of 1.0 mL of 20% dimethyl benzaldehyde solution, the mixture was incubated at 60°C for 20 minutes. The absorbance of each sample at 550 nm was measured. The results are expressed in milligrams of hydroxyproline per gram of wet lung weight using hydroxyproline standards (Sigma). Lipid peroxidation was assessed by measuring the amounts of malondialdehyde (MDA) via the TBA color reaction using the method described by Buege and Aust (26). Briefly, 0.5 mL of plasma was mixed with 2.5 mL of trichloroacetic acid (10%, w/v). The samples were then centrifuged at 3000 rpm for 10 min, and 2 mL of each sample supernatant were transferred to a test tube containing 1 ml of TBA solution (0.67%, w/v). The mixture was kept in boiling water for 10 minutes, producing a pink colored solution. The mixture was then cooled immediately, and the absorbance was measured at 532 nm using a spectrophotometer (UV-1650 PC, Shimadzu, Japan). Tetraethoxypropane was used as a standard, and the MDA content was expressed as µmol/L plasma. The results were expressed as the mean ± SD, and all statistical comparisons were made by means of a one-way ANOVA test, followed by Tukey’s post hoc analysis. A P value less than 0.05 was considered significant. The lung hydroxyproline content to collagen accumulation ratio in the control and BLM groups was 1.77 ± 0.09 and 6.01 ± 0.14 mg/g tissue, respectively (Figure 1). The treatment with atorvastatin at all doses (10, 20, and 40 mg/kg) significantly reduced the lung hydroxyproline content as compared to that of the BLM group (P < 0.05). The values are expressed as the mean ± SD (n = 6). *P < 0.05, significant difference vs. the control group. #P < 0.05, significant difference vs. the BLM group. A signiﬁcant rise was observed in the plasma MDA levels (an index of lipid peroxidation) of the rats exposed to BLM when compared with those of the control group (P < 0.05). The plasma MDA level in the control and BLM groups was 1.25 ± 0.15 and 2.97 ± 0.09 µmol/L, respectively. As shown in Figure 2, the MDA level decreased in the rats pretreated with atorvastatin (P < 0.05). Pulmonary fibrosis revealed infiltration of inflammatory cells, proliferation of fibroblasts, and extracellular matrix deposition. As described in section 3.5, a normal lung was assigned a score of 0, and total fibrosis was assigned a score of 8. As shown in the lung photomicrographs (Figure 3), the lung sections of the rats pretreated with 10 mg/kg of atorvastatin (group 3) had a score of 5 - 6, whereas those treated with doses of 20 and 40 mg/kg had a score of 4 - 5 (groups 4 and 5, respectively). Lung tissues were obtained 21 days after instillation of BLM and stained with H&E. 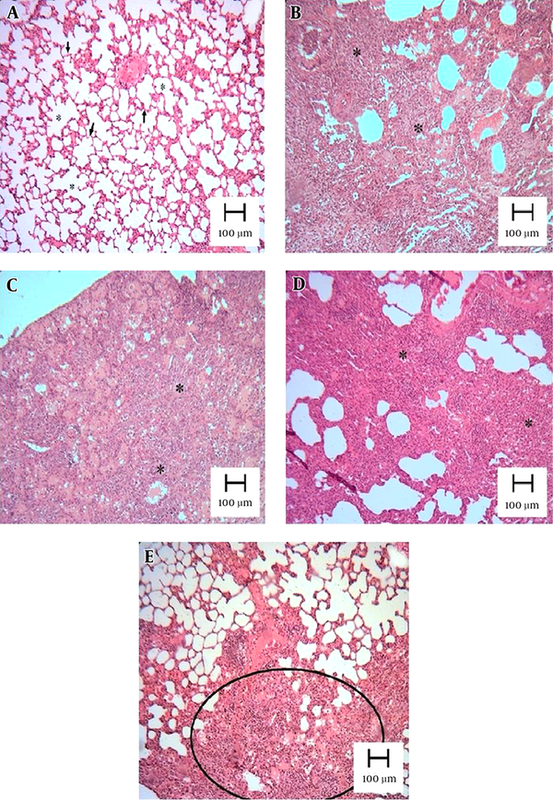 Appearance of rat lungs in the different groups: (A) control, (B) BLM, (C) BLM and pretreatment with 10 mg/kg of atorvastatin, (D) BLM and pretreatment with 20 mg/kg of atorvastatin, and (E) BLM and pretreatment with 40 mg/kg of atorvastatin. The lung parenchyma of the control was well preserved and intact. Extensive interstitial infiltration and fibrosis was visible in the BLM group (B). 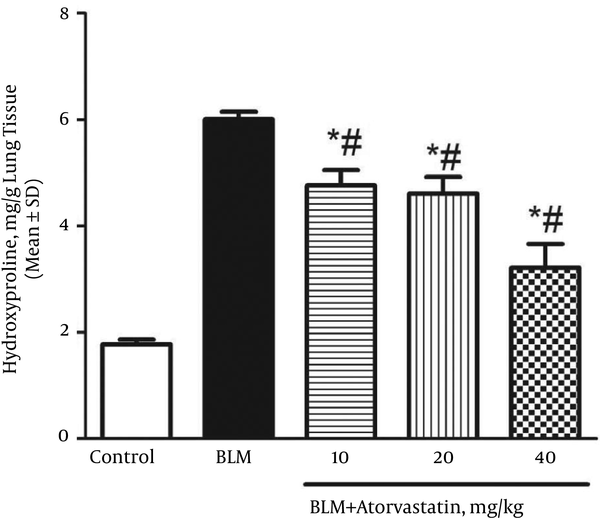 There was a marked lack of BLM-induced histological changes in the rat lungs in the BLM + 20 mg/kg atorvastatin group (D) and BLM + 40 mg/kg atorvastatin group (E). The anti-inflammatory properties of statins are numerous and complex. Although incompletely understood, there is tantalizing evidence that they might prove to be of clinical benefit in the treatment of a range of inflammatory lung diseases. To clarify this issue, evidence is needed on the efficacy of statins in different inflammatory lung diseases. The results of this study demonstrate the success of atorvastatin in the treatment of BLM-induced pulmonary fibrosis. The molecular structure of atorvastatin hydroxyl metabolites enables them to act as electron donors and, hence, as potent antioxidants (19). Therefore, even if the parent drug does not show antioxidant properties, its metabolites may have antioxidant activity in vivo. Kiener et al. (27) showed that lipophilic statins, such as atorvastatin and simvastatin, had a much greater effect on inflammatory responses in human and mouse models than hydrophilic pravastatin. As inflammation and fibrosis are the two determinants of the progression of pulmonary fibrosis, the potential beneficial effects of atorvastatin on BLM-induced pulmonary fibrosis can be measured in the early inflammatory and late fibrotic phases. Singh et al. (28) reported that atorvastatin therapy had a dose-response effect with regard to decreasing oxidized LDL. They also reported other pleiotropic effects of the drug, evidenced by a significant decrease in related inflammatory markers, including high sensitivity C-reactive protein, matrix metalloproteinase-9, and NF-κB activity, especially at high doses (i.e., 80 mg/d). There is an ongoing debate about the widespread use of statins and at what point their use is essential. The present study showed that atorvastatin had a dramatic antifibrotic effect and that part of this effect seemed to be due to the antioxidant properties of the parent drug and/or its metabolites. The results point to inhibition of LDL oxidation by atorvastatin, in addition to its other pleiotropic effects. The potential of antioxidant treatments in human IPF and BLM-induced lung fibrosis, a popular rat model of human pulmonary ﬁbrosis, has been extensively investigated. The use of such treatments is based on the presumption that chronic persistent inﬂammation precedes IPF and that aggressive suppression of this inﬂammation will block subsequent scar formation and disease progression (29). BLM-induced pulmonary injury initially results in the generation of oxidant species by an iron-dependent mechanism (30). Further damage is thought to be elicited by the production of increased amounts of ROS and reactive nitrogen species by activated inﬂammatory cells recruited into the damaged lung following BLM exposure (31). The observed protective effects of atorvastatin in the present study were associated with diminished accumulation of collagen, as assessed by the lung hydroxyproline content, as well as an improved pathological grading. BLM-induced lung injury also probably involved the generation of ROS by an iron-dependent mechanism. These ROS damage lung cells and activate inﬂammatory cells, which produce additional ROS in the pulmonary space. Both drugs showed signiﬁcant free radical scavenging activity in this experiment, as shown by the reduction in MDA levels of lung tissue lesions and additional lung tissue damage. In the present study, the histology of the lung tissue of the rats pretreated with atorvastatin suggested that the drug may exert antioxidant activity by decreasing MDA levels in the lung. Studies have shown that statins exerted anti-inflammatory effects in numerous tissues via the activation of peroxisome proliferator-activated receptors, which regulate important cellular functions, such as glucose and lipid catabolism and cellular differentiation, proliferation, and survival (32-34), and that these receptors were promising therapeutic targets in bladder cancer (35). Furthermore, research demonstrated that the effects of statins, namely atorvastatin, seemed to be synergistically increased by cycloxygenase 2 inhibitors (36), These data reinforce the role played by inflammation in lung fibrosis and the importance of preventive strategies based on anti-inflammatory activity, such as that demonstrated by atorvastatin in the present study. The beneficial roles of atorvastatin in the treatment of lung injury and pulmonary fibrosis are represented graphically in Figure 4 (37, 38). In conclusion, the findings of the current study illustrate that BLM administration resulted in lung fibrosis in rats via increased oxidative stress and fibrotic events and that the antioxidant and anti-inflammatory properties of atorvastatin dose dependently prevented oxidative stress and fibrosis. This paper was extracted from the thesis of Mohammad Rahim Zerafatfard Pharm.D that was submitted to the school of pharmacy of Ahvaz Jundishapur University of Medical Sciences and financially supported by a grant from the physiology research center. Authors’ Contribution: Study concept and design, drafting, and revision of the manuscript: Mohammad Javad Khodayar, Mohammad Rahim Zerafatfard and Mehdi Goudarzi; testing procedures, statistical analysis, and interpretation of the data: Mohammad Rahim Zerafatfard, Mohammad Javad Khodayar, Ali Asghar Hemmeti, Mehdi Goudarzi, Anahita Rezaie, Mohammad Reza Rashidi Nooshabadi and Milad Kiani. Funding/Support: This research was financially supported by a grant from the physiology research center of Ahvaz Jundishapur University of Medical Sciences.